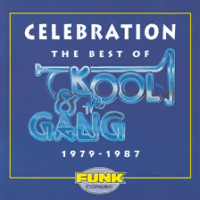 This page is for the original version of Kool and the Gang's Celebration. For the WaveGroup cover (and its remix) of the song, please see Celebration (WaveGroup). Not to be confused with the beatmania IIDX song celebrate by JJ COMPANY. Celebration is sampled in LET'S GET DOWN, from DanceDanceRevolution. A MIDI version of Celebration appears in My First DanceDanceRevolution. Celebration was covered by Kylie Minogue and released as a single in 1992. An orgel version of Celebration can be found in EMI's version of the DanceDanceRevolution 3D Book, a crane game prize made to promote the upcoming Japanese release of DanceDanceRevolution New Moves, which ended up being cancelled. A cover of Celebration can be found in Karaoke Revolution. Celebration is Kool and the Gang's only #1 hit. This page was last edited on 28 March 2019, at 12:15.